A longtime New Orleans resident now living in Auburn, Alabama, Suzanne is a veteran journalist with more than fifty national awards in writing and editing nonfiction. She is a graduate of the University of Alabama, and a native of Winfield, Alabama. During her daytime job, Suzanne is associate editor of Auburn Magazine, the quarterly magazine of the Auburn University Alumni Association. She has also worked at Tulane University in New Orleans, the University of San Diego, Rice University in Houston, and at the University of Illinois. Awards include: the Robert S. Sibley Award for the best university magazine in the U.S. and Canada, for the Rice University Sallyport; feature writing awards in 2009 and 2010 from Writer’s Digest magazine; and more than 50 awards in writing and editing from the Council for the Advancement and Support of Education. Suzanne is an active member of Science Fiction & Fantasy Writers of America, Romance Writers of America, and is a member of the Georgia, Southern Magic, and Fantasy, Futuristic & Paranormal chapters of RWA. Learn more at Suzanne Johnson’s website. Sentinels of New Orleans — (2012-2016) Publisher: As the junior wizard sentinel for New Orleans, Drusilla Jaco’s job involves a lot more potion-mixing and pixie-retrieval than sniffing out supernatural bad guys like rogue vampires and lethal were-creatures. DJ’s boss and mentor, Gerald St. Simon, is the wizard tasked with protecting the city from anyone or anything that might slip over from the preternatural beyond. Then Hurricane Katrina hammers New Orleans’ fragile levees, unleashing more than just dangerous flood waters. While winds howled and Lake Pontchartrain surged, the borders between the modern city and the Otherworld crumbled. Now, the undead and the restless are roaming the Big Easy, and a serial killer with ties to voodoo is murdering the soldiers sent to help the city recover. To make it worse, Gerry has gone missing, the wizards’ Elders have assigned a grenade-toting assassin as DJ’s new partner, and undead pirate Jean Lafitte wants to make her walk his plank. The search for Gerry and for the serial killer turns personal when DJ learns the hard way that loyalty requires sacrifice, allies come from the unlikeliest places, and duty mixed with love creates one bitter gumbo. 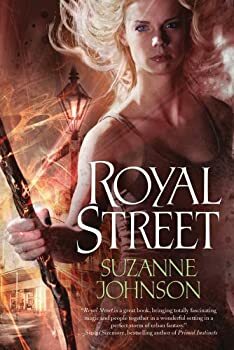 Royal Street, by Suzanne Johnson, is the first in a new urban fantasy series set in New Orleans. Drusilla Jaco, a.k.a. DJ, is one of the city’s two wizard sentinels, which means she’s assigned to keep an eye on paranormal trouble in town. The other sentinel is Gerry, Drusilla’s mentor and father figure. With Hurricane Katrina on the way, DJ evacuates while Gerry stays behind. When the storm passes, DJ returns to a devastated New Orleans to find Gerry missing, new breaches opened between this world and the Beyond, and a serial killer who leaves voodoo paraphernalia at the scenes of the crimes.